More produce from the garden! 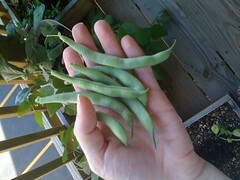 my mini garden often gives mini produce, but these beans i grew myself from seeds and look at them! i am so proud. i don't want to go to my grandparents farm for the fourth of july. i want to stay here and bring in the harvest.